Craft Renaissance Gallery at Craft Renaissance Workshops & Gallery01873 880879work Craft CentreSituated in converted barn buildings we have a stunning oak framed gallery, shop, and cafe. Our focus is art and craft made in Wales carefully selected to maintain the highest quality across all mediums. We also have an exciting exhibition programme which brings talented newcomers and nationally known names to the gallery. The gallery and shop have a wide variety of high quality art and craft which is constantly refreshed. We select a range of work for sale from affordable gift items to stunning unique artworks. We have a small cafe within the gallery where you can sit and relax, enjoying fresh coffee or afternoon tea and maybe treat yourself to a delicious cake. We offer opportunities for adult and children to learn new skills and develop their talents in our teaching workshops and classes. The centre is also home to a working community of artists and makers. Makers are available for commissioned work. The workshops are not open everyday to the public but you can meet all makers on site by appointment - please call the gallery. We have a dramatic stone amphitheatre outside the gallery where we host art and craft fairs, summer concerts and special events. 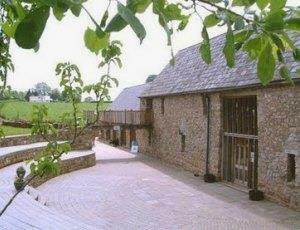 Situated in converted barn buildings we have a stunning oak framed gallery, shop, and cafe. Our focus is art and craft made in Wales carefully selected to maintain the highest quality across all mediums. Dogs are accepted on a lead with their owners, but any breakages would need to be paid for. Exit Usk by the Three Salmons inn onto the B4598 (North West) towards Abergavenny. Continue on B4598 3 miles to Kemeys Commander. You will see our converted barn buildings on the lefthand side of the road if you reach the Chainbridge Pub on your left you have missed the turning.